Fearful Quarrels, and Brutal Violence, Are the Natural Consequences of the Frequent Use of the Bottle by George Cruikshank. 1847. Click on image to obtain more information. Certainly Cruikshank's images of child neglect and wife abuse constitute a rarely pictured social realism. Illustrators of Dickens’s Oliver Twist; or, The Parish Boy's Progress, have tended to shy away from the murder of Nancy, Bill Sikes's common-law wife, although that murder later became the high point of Dickens's public readings. Treatment of the subject as late as the Household Edition have been carefully oblique (as in James Mahoney's He moved, backwards, towards the door: dragging the dog with him, 1871) rather than blatantly graphic. Although Dickens might discretely write about the male abuses of women and children, his illustrators were reluctant to depict it. Thus, Dickens's readers in the year after Cruikshank issued The Bottle must have been shocked by the scene of domestic violence in which the formerly amiable Mrs. Tetterby, the struggling newsagent's wife in The Haunted Man and The Ghost's Bargain, under the baleful influence of Redlaw's baleful double, loses all sense of sentiment and maternal affection, and turns angrily on her oldest son, Johnny, a brief but brutal scene underscored in Harry Furniss's much later illustration The Tetterbys' Baby (1910). 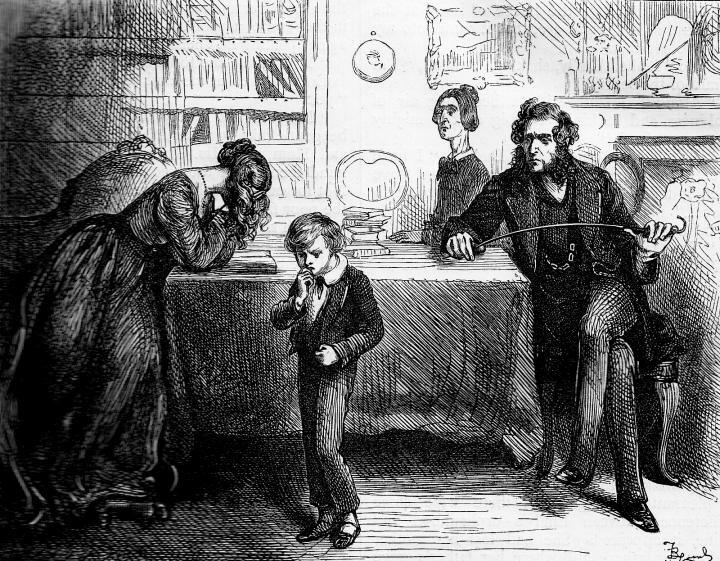 Although previous illustrators had depicted Johnny, the baby-minder, being chastised by his parents for neglecting his charge, only Furniss actually depicted Johnny's physical abuse, an action uncharacteristic for his mother and father, who are doting parents to their large brood at the beginning of the last of Dickens's Christmas Books. 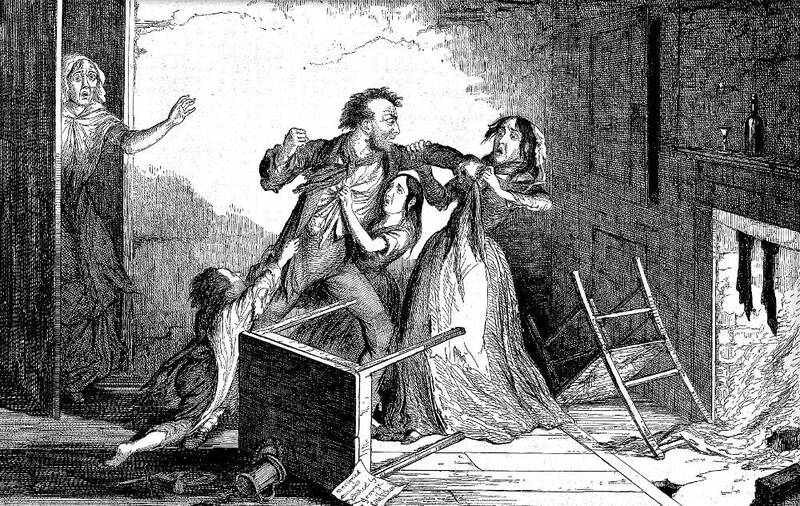 Dickens's works rarely depict physical abuse of women, and in the 1859 scenes of Gerry Cruncher's "correcting" his wife's "flopping" (praying for her husband in an emotional, evangelical fashion) in A Tale of Two Cities the writer seems to be using Gerry's putting down of his wife's conduct as comic relief. He is much more serious about Murdstone's mental and emotional abuse of David and his young mother in David Copperfield (1849-50), although it was not Dickens's original illustrator, Phiz but Fred Barnard who depicted such threatening behaviour towards wife and child. And when we came at last to the five thousand cheeses (canes he made it that day, I remember), my mother burst out crying.